is that v4? or maybe V5? V4 with a pretty strong corset morph dialed in... from the Roxana outfit. I don't like to use D/S, so no Genesis, no V5. I caught the Christmas special, and was particularly enthralled by Clara's dress. So, being a clothes freak and MD user, I just had to start working on one. It's not *exactly* the same: there are ruffles at the shirt-front instead of pin-tucks, and ruffles instead of gathers on the underskirt. But you can see the inspiration (I hope!). Still need to do texturing and detail work on it, though. I haven't decided on whether to tackle the bow that I *think* I see on top of the bustle. Non Whovian now lurking to see IF this goes any further as I am drooling about that dress. I just finished up the MD work; it took about a month to do... the bustle was fighting me, as I tried for a symmetrical waterfall effect that I've seen on some reference pics. Should be rendering it out in the next week or two, then adding post-work.... , (dare I say it since I'm not a DAZ official...) ...soon. 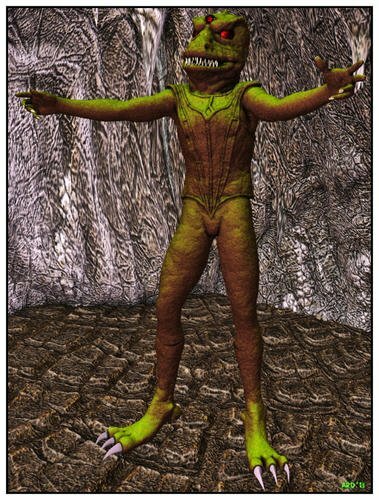 anyway, it isnt really a case of reptilians evolving to look more like humans - reptilians and humans are evolving to look more like Gallifreyans. ...semi somewhat lurking Whovian here who is doing the same. That is so much like something the Countess of Swindon would wear at one of the "Season" balls.. 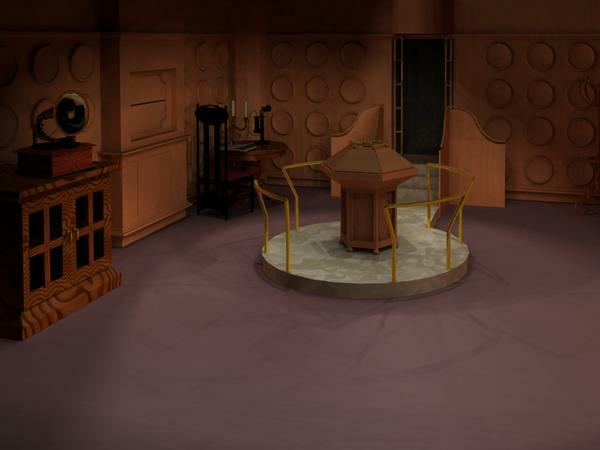 I'm surprised nobody has tried to tackle the new TARDIS interior yet. I think i can just about make a top hat for the Doctor. Speaking of which, i do hope he is going to retain his Victorian look throughout the next season - i like it. ...?Countess of Swindon? Did I miss something along the way? Looking for the right hair... either her updo, or the looser style she wears as a serving wench. Nothing I've seen has those wings pulled to the side, so I may have to do some painting in postwork. 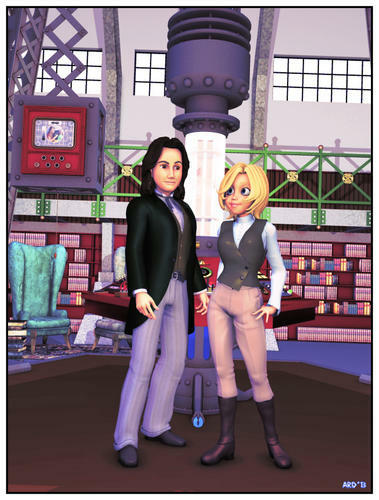 As far as the "wings" on the hair, I'm not certain what effect you're looking for, but you might try combining Maya's "Anime Flip" hair (if you have it: most all of his hair models are gone now from his site) with your other shapes. Well, the dress would have to be Poser/dynamic only, if/when I release it, unless someone undertakes the enormous task of remeshing/rigging for a conforming model. ...the Countess of Swindon, Her Ladyship Meggan Grande, widow of the late Count of Swindon, Sir Guy Grande, is a major character in my Rhapsody in Shadow story. She adopts my little Leela and helps the child like pianist (and former Croatian resistance fighter) back to the concert stage. when is the next new episode? Were you the one to compose a render of Romana II (Lalla Ward) wearing a sun hat and placing her hand upon the eye-stalk of a Dalek, almost as though she were consoling it? If so, what figure did you employ? That's actually a pretty good interpretation of Ms. Ward's features. Used only V4 and several photos of Ms Ward taken at different angles for reference. 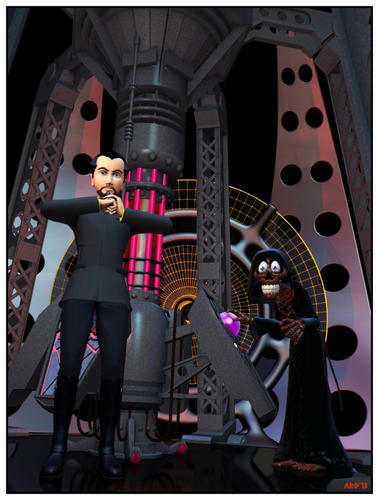 If it was all "dial spins" as opposed to morphing it with magnets or deformers, would you possibly be willing to share her features as a .FC2 "face" pose"? Or if you'd rather "hang onto it" as something that is personally special to you alone, I'll certainly understand. 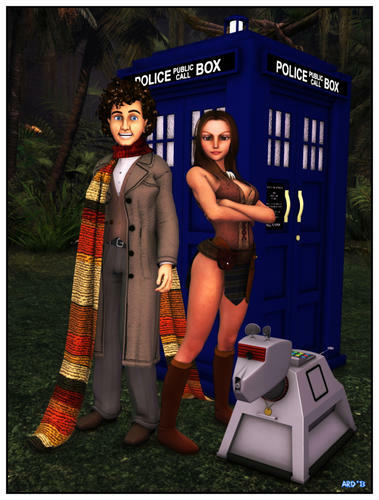 ...unfortunately I no longer have the file as it was on an HD that died a couple years ago along with a rather silly pic of Mel and a Dalek on holiday at the beach (with a bottle of champagne chilling in Lord Stanley's Cup). I suspect nearly everyone here can personally sympathize with that situation. Besides, I was hoping the face had been accomplished with Aiko 3 since AlDemps and I had assembled a near perfect "Horns of Nimon" ensemble. 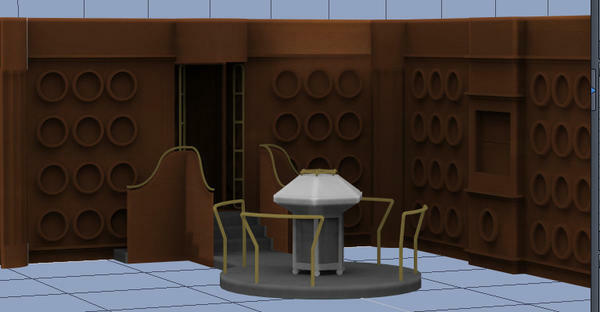 Slightly off topic (although 1 is based on the Master's TARDIS from 'The Time Monster'). I have uploaded a set of computer props for use in your renders. They are simple static props - no moving parts. OBJ files are included for use in other programs. "Nabbed" them earlier this evening. I got a kick from the "company" or "brand" name affixed to the lower right corner of the cabinets being your initials. Clever! Just started on this, the obscure alternate console room. oh , my . i certainly hope you will be good enough to share that one with the reat of us . I'll add the computer banks to The Doctor Who List, then! I was planning to release it on ShareCG when done. I've always liked this particular console room, it's sort of the forgotten one and nobody has ever (as far as I know) released it. Here's a minor update, I prepared a basic fake wood grain texture so I could see how it looked. Also fixed some geometry problems here and there. am i correct in thinking you are using hexagon to make this ? if so couldnt you use the vertex modeling symmetry tools to flip it into the right way round ? 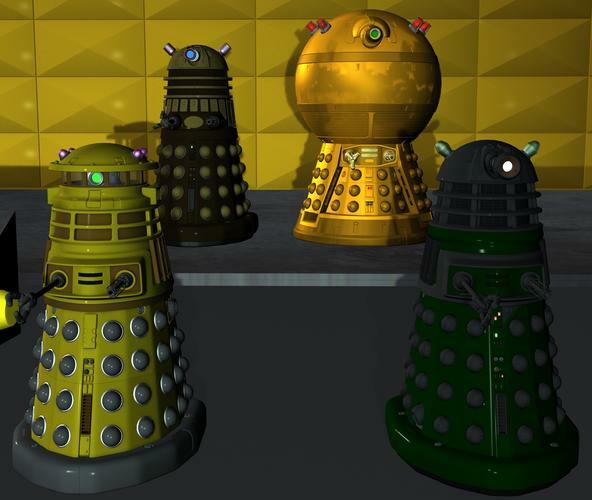 The leaders of the Daleks, the Golden Emperor, and the Supreme Daleks. 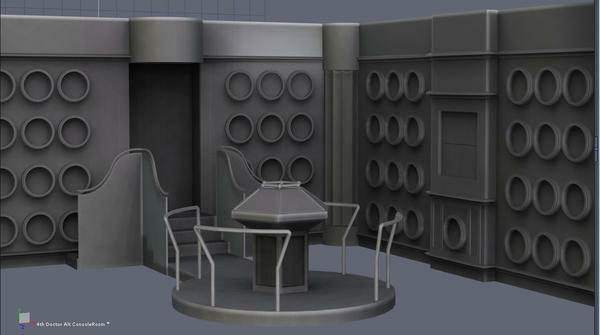 That console room looks to be coming on nicely. Here's a post of the current state of my Secondary Console Room model. I made a real mess of it trying to UV it and of course it was all backwards so I redid a lot of the geometry of the walls. For the main structure, it's almost done, just need to create some doors (front and side) and UV map it. Right now the textures shown are shaders in Carrara. The console itself is another matter. It's set up to be a hexagonal writing desk, so each wedge of the hexagon is really a cabinet door. 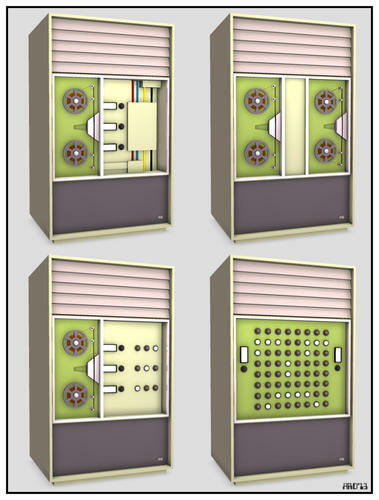 I have to create the insides of each and then figure out how to set up each of the covers to open/close in poser. I th ink it will take a little longer than I'd first thought. But it's getting there. Just messing about with Bill's (Redfern's) free Gorn head from the Star Trek thread. I was trying to see if I could get something that looked as if it could be related to a Silurian. I parented the head to Hiro3, dressed him in Bluto's cardassian vest (from the Star Trek thread) & used feet from the A3 Sera set (renderosity freestuff). I added a third eye (as per the classic silurian) - a prop from the Davros set. They say his mother was a T-Rex....but not to his face (atleast not twice).